Wait: Royal Enfield never made a bicycle like this. Did it? 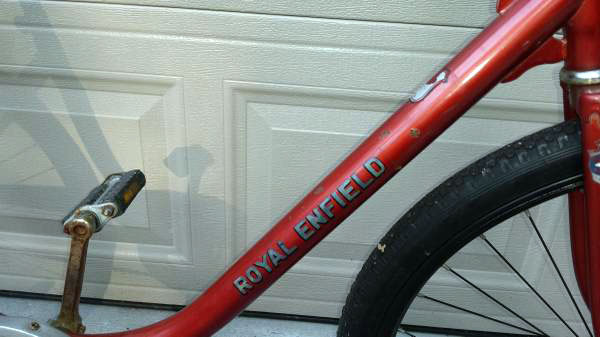 Here's a Royal Enfield bicycle Royal Enfield never made — at least it was never in the catalog. But it's real, and you can buy it on CraigsList in York, Pa. The ad stopped me cold when I saw it because at first glance it appears to show a Royal Enfield Compact, the little folding bicycle marketed in the United States by a New Jersey company under the Royal Enfield name in the 1980s. Catalog photo of a Royal Enfield Compact. Note the hinge. Except that this bicycle doesn't fold. It doesn't even have the folding mechanism in the swooping U-shaped, step-through frame. Is this a previously unknown factory product? 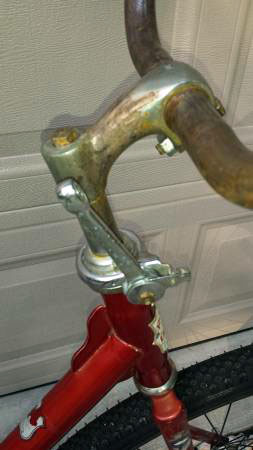 Or did someone somewhere painstakingly weld solid the two-part frame of a folding bicycle? I would never have guessed the answer, which came courtesy of the seller, whose name is Mark. There's no hinge in the frame of the CraigsList bicycle. 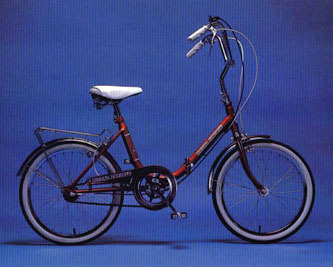 The explanation concerns a different Royal Enfield model that was sold by that same New Jersey company: an adult tricycle. The Royal Enfield tricycle also had the swan-like U-shaped frame but with only one exception I've ever seen, the tricycle did not fold. "Thanks for reaching out!" Mark wrote. 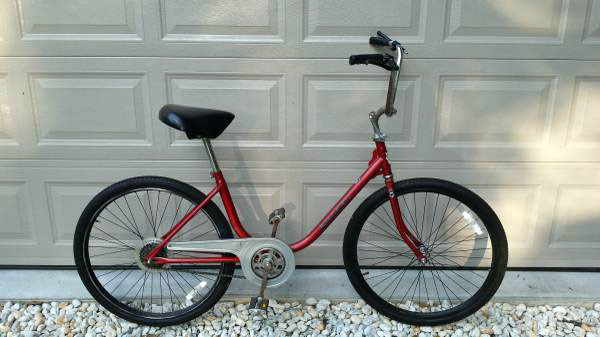 "I buy and sell bikes as a hobby and ran across this one while searching for a tricycle rear end. I have a project in mind to make a small two-seater, four-wheel bike for my wife and I to ride around the neighborhood, and wanted to start with a trike rear end and build around it. 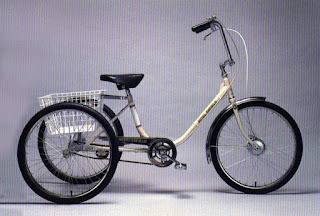 Catalog photo of a Royal Enfield tricycle. No hinge here. "Anyway, this Royal Enfield started life as a four speed trike with 24-inch wheels." So that's it! Mark removed the trike rear end for use with his project, fit a set of wheels he had laying around, and turned a Royal Enfield tricycle into a Royal Enfield bicycle that never had been a folder. The tricycle rear end, removed for use in a future project. "Its now a cool little bike with some character and will make someone a nice cruiser," he wrote. 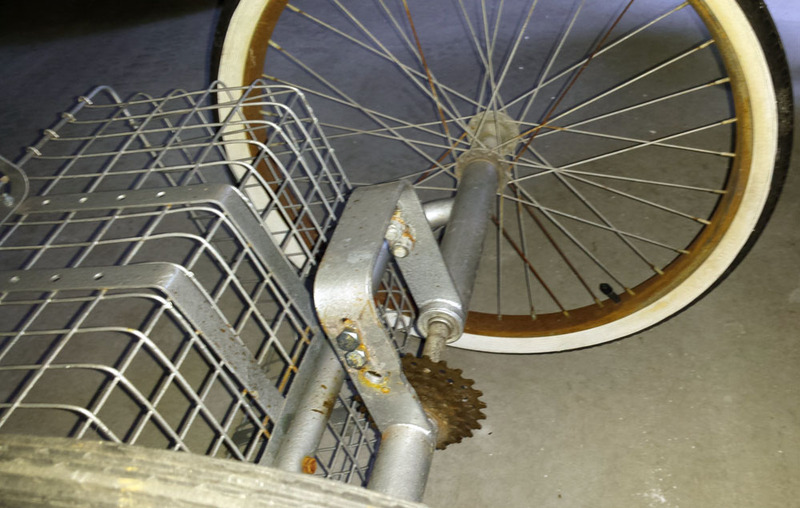 Mark hung on to the tricycle's front wheel, with its drum brake, for his project. 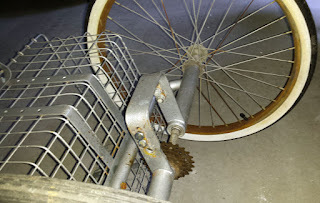 As for the Schwinn shifter on the bike, that's "definitely not stock," and it's not hooked up to the derailleur gears at the rear, so the bicycle for sale has only a single speed at the moment. And it will need brakes. Gear shift is isn't hooked up. Mark notes in his ad that it would make a unique commuter. Where can I buy parts for them.. I need a goose neck for mine..